Misool, Kofiau & Salawati: Should you go? 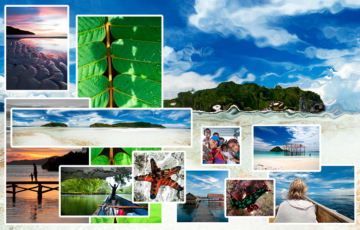 A travel guide for Raja Ampat visitors. The second largest of Raja Ampat’s Four Kings, Misool lies a 150km boat journey southwest of Sorong. There’s a lot to see at Misool and we know there are homestays on the island. Our work for the Homestay Association demands all our available time when visiting Raja Ampat, so (sadly) we’ve never had the opportunity to even visit those other islands! We know who can help though. Abdul Muthalib was born on Misool, is an experienced tour leader and rescue diver, and can organise anything you might want to do around Misool. These Sorong based guides can also provide everything you need to know about how to get to and where to stay at Misool, Kofiau or Salawati. 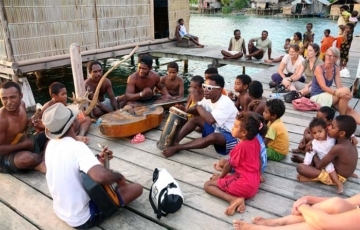 Our Raja Ampat Travellers’ Forum can also be a good source of Misool info, and has several members who know far more about Misool and its homestays than we do. Join the group to contact them. Please note that Misool ferry schedules are subject to change without notice, and that the information provided below, while correct in early 2018, may well have changed. We recommend contacting John Urbon for the latest information. About 9 hours, IDR 200,000 – 2 level beds on 2 sleeping decks are included. A private 2 bed cabin cost 300,000 IDR if available (ask ferry crew members about these). To Sorong, Thursday and Sunday. Departure 0700 Fafanlap, 0800 Yello, 1000 Foley. Arrival 1700-1800-1900 (almost always late to Sorong). 3 times per week, 4.5 hour trip, Ticket price IDR 250,000 (plus surcharge if you want airconditioned VIP seats). Great news for those wanting to go kayaking in Misool: Millekul Adventures have 16 sea kayaks based at Pulau Panun in the eastern Misool archipelago. Millekul work with Misool homestays and offer a range of paddling adventures. There are short 4 day exploratory adventures perfect for beginners, as well as 2 and 3 week trips better suited to experienced paddlers. Millekul’s Misool kayaking expedition prices are all inclusive, with participants departing from and returning to Sorong. You’ll find Millekul’s trip schedules here. Given that we know nothing about it, your best bet is to ask in our Raja Ampat Traveller’s Forum facebook group, or contact one of the guides recommended above. Free WiFi connections are extremely rare in Raja Ampat. You will need a local SIM for your phone. See this page for details. 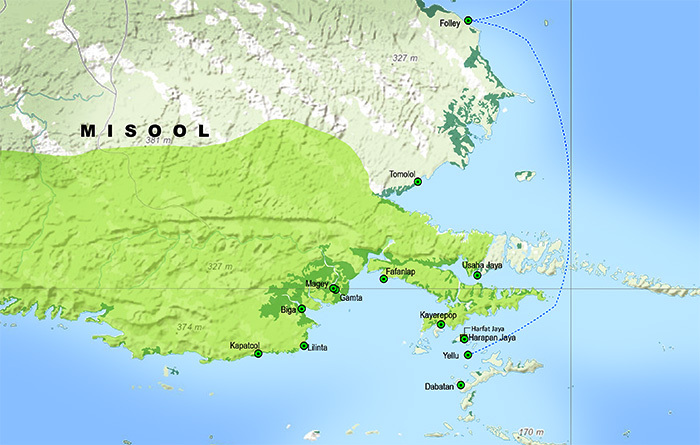 The Kofiau island group is also about 150 km west of Sorong, and 50km to the north of Misool. We have heard that there is at least one homestay there, and have stared longingly at it from a plane window on flights into and out of Sorong. It looks beautiful. Truly remote and untouched. The guides linked above will be able to help you if it’s on your must go list. The third largest of Raja Ampat’s Four Kings, Salawati is the closest of the Raja Ampat islands to Sorong. Lying west of Sorong, a strait separates Salawati from that city and the West Papuan mainland. Salawati lies immediately to the south of Batanta, from which it is separated by the narrow Sagawin Strait. Only part of Salawati lies in the Raja Ampat Regency and we’ve never heard of any homestays there. That doesn’t mean there are none! Again, John, Alex or Alberth above will be able to help you if you particularly want to visit Salawati. good afternoon can you let me know how I can go to Piaynemo island from Misool? Do I have to take the ferry Misool to Sorong and then wasai ?and then take the hotel boat until Piaynemo ,or do they have a ferry Misool wasai? The way that most people would do that is by taking the ferry back to Sorong, then either joining a Piaynemo day trip from Sorong, or (if staying at Piaynemo or nearby) the public ferry to Waisai then private transport to your accommodation. See this page for the details. could you kindly advise me (send me a link / links) how to find the schedule of a ferry / ferries from Sorong to Misool. The information to look it up at the harbor in Sorong isn’t really helpful. Sorry Gerard, but there are no ferry schedules published online. We would have linked to them if there were. All we can tell you is that a Marina Express boat runs between Sorong and Misool’s 35, Foley, Yellu & Fafanlap harbours. Schedules change without notice. 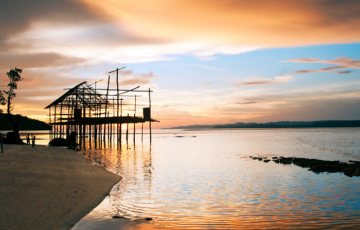 Any of the 3 Sorong-based guides linked above can give you up to date information. They all speak English and we’ve provided contact phone numbers and email addresses for those that have them. As we tried to make clear above, we can’t help you with homestays on Misool. One of the guides linked at the bottom of the Misool section can. Or you could try asking this question in our Raja Ampat Travellers’ Forum facebook group.